Let the light never fade! Who is more foolish, the child afraid of the dark or the man afraid of the light? We have to give light a chance and see how it illuminates path to peace. Lets start to live in rooms full of light as in the right light, at the right time, everything is extraordinary. Lets smile again. 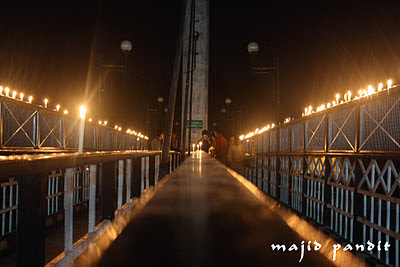 Above: Diwali celebrations stretching over a foot-bridge of river Jhelum, Srinagar.